Are there any good restaurants near Sagrada Familia? ANY GOOD RESTAURANTS NEAR SAGRADA FAMILIA? Home » ANY GOOD RESTAURANTS NEAR SAGRADA FAMILIA? I usually tell my guests to avoid eating at the restaurants near Sagrada Familia: most of them are tourist traps. Unless you want to eat at McDonalds, KFC or Starbucks (not the kind of Spanish restaurant I’d be wishing to try…). But sometimes when you are sightseeing, you can’t choose much where you’ll be for lunch. Maybe you spent longer than you thought inside the church. Or you had to wait too long in line to get in and it got late. Or you have online tickets in the early afternoon and it’s more convenient to eat nearby. That’s why today I’m going to share with you my favorite places to eat around the Sagrada Familia church. 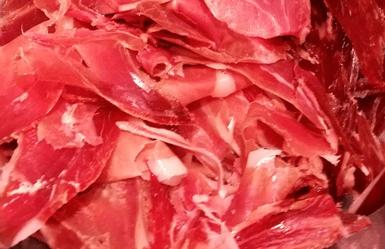 Bellota is the Spanish word for acorn, and bellota ham (jamón de bellota) is one of the most valued hams in Spain. So this restaurant is the perfect place to taste some typical Spanish cured meats and hams, specially from the Extremadura region. Delicious tapas and very good wines any time of the day. Their menu includes typical Spanish soups, salads, sandwiches and, of course, excellent Iberian meats. 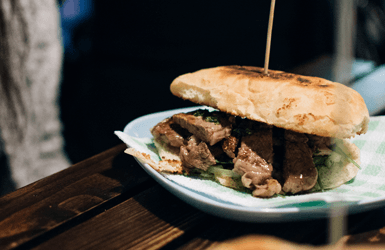 The first meatbar in Barcelona, it specializes in creative and delicious meat tapas. It’s not a typical restaurant with tables, but you sit in stools and eat by the counter. If you are a meat-lover, don’t go to any other of the restaurants near la Sagrada Familia: This is the place to be! During local lunchtime, there’s often a long line to eat in La Piazzenza, because their pizzas are really delicious. The menu offers also tapas and pasta but pizza is definitely the reason to come here. Really tasty pizzas with many ingredients. 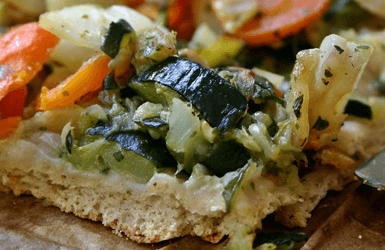 Our favorite is the amazing Vegetable Calzone. ‘Lata’ means tin and ‘barra’ means bar counter. Here you will find a lot of high quality canned food (mostly fish) and a really spectacular marble bar. There are more than 20 specialties including sardines, tuna, mackerel, and fish spreads, all of them traditionally hand-made. A lovely light cold tapas lunch. Plus, if you liked what you ate, you can buy your favorite canned food at their shop. A it further away, but still within walking distance, this is a typical Spanish restaurant where you can eat homemade paella, salads, meat or fish. The restaurant is really homely, and they serve value for money. It’s probably the only one of the restaurants near Sagrada Familia in its style. I spent two years working in Sagrada Familia, and we were given 1 hour for lunch. While the builders usually bring their own food from home and eat it in the building site cantine, the administration and the shop staff usually prefer to eat out. Their favorite place for a daily menu (a selection of starters, main course and dessert for a set price, that changes every day and is quickly served) was this neighborhood bar around the corner from the church. Their decor is not fancy at all, but the food is home-made and the recipes are authentically Spanish. By the way, you might also want to check out our post about hotels near La Sagrada Familia. So what about you? Head to the comments below and tells us: do you know of any other recommendable restaurants near Sagrada Familia? LOOKING FOR RESTAURANTS NEAR PARK GUELL?